The following is a sponsored post in partnership with Nordgreen Copenhagen. All opinions are 100% my own. I have always loved cool watches that set themselves apart through design, function, or materials. Although a watch must perform its main function well (keeping time) it also can be a part of your signature style. Watches can make a statement or add flair, or they can be the trusty friend that pulls your whole look together. For capsule wardrobe enthusiasts, you probably can’t get more versatile than a minimalist timepiece with Danish design. Watches also make one of the best presents because they last a really long time and (usually) fit a wide variety of sizes. I have to say, I am/was nervous to do my first sponsored post because it’s important to me to encourage thoughtful spending. I will never accept product or payment from a company that does not align with my beliefs. But, when Nordgreen (nordgreen.com) reached out to me, I was intrigued for so many reasons! Read on to learn about why a Nordgreen watch is the perfect Valentine’s Day present (or Mothers’ Day or Fathers’ Day present, for that matter!) I apologize that Valentine’s Day is just days away and I’m just posting this now - things have been a bit hectic - but the 20% off will make up for it! What impressed me about Nordgreen from the start is how thoughtful they have been about each part of the company, and their name is no different. “Nord” is North, which represents their Scandinavian heritage. “Green” represents their Corporate Social Responsibility program, which is what really drew me to the company. The company makes every effort to use recyclable and/or sustainable materials, including the felt inside the box, which is made from recycled plastic. 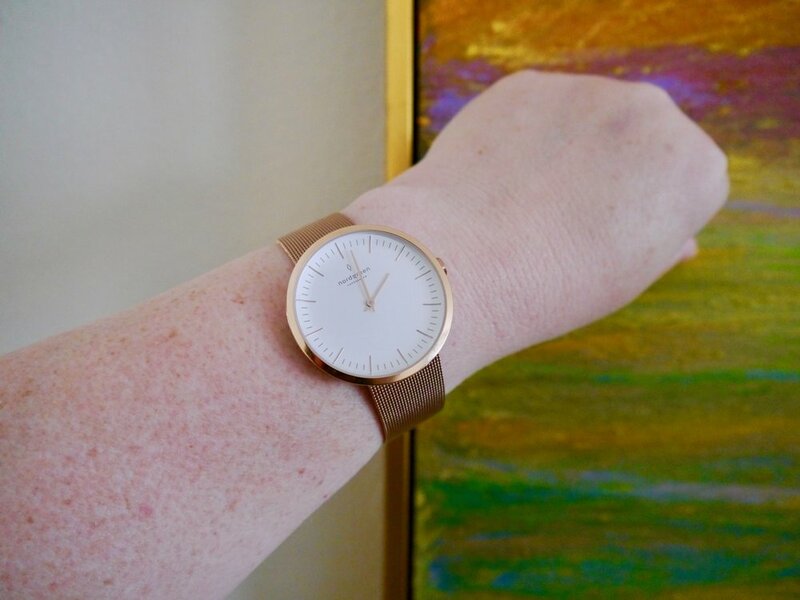 In addition to their sustainability efforts, each purchaser of a Nordgreen watch has the opportunity to give back a portion of their purchase through Nordgreen’s “Giving Back” program. Customers get to choose from one of three charities to support access to clean water, the gift of education, or rain forest preservation. Donations to support reforestation also help Nordgreen be a carbon-neutral company. I admit it: I am a bit of a design snob. When it comes to watches, though, I’m nothing compared to my husband! I mean, this is a guy who just received multiple watch books for his recent birthday! He knows a ton about watches, while I just know how they look. 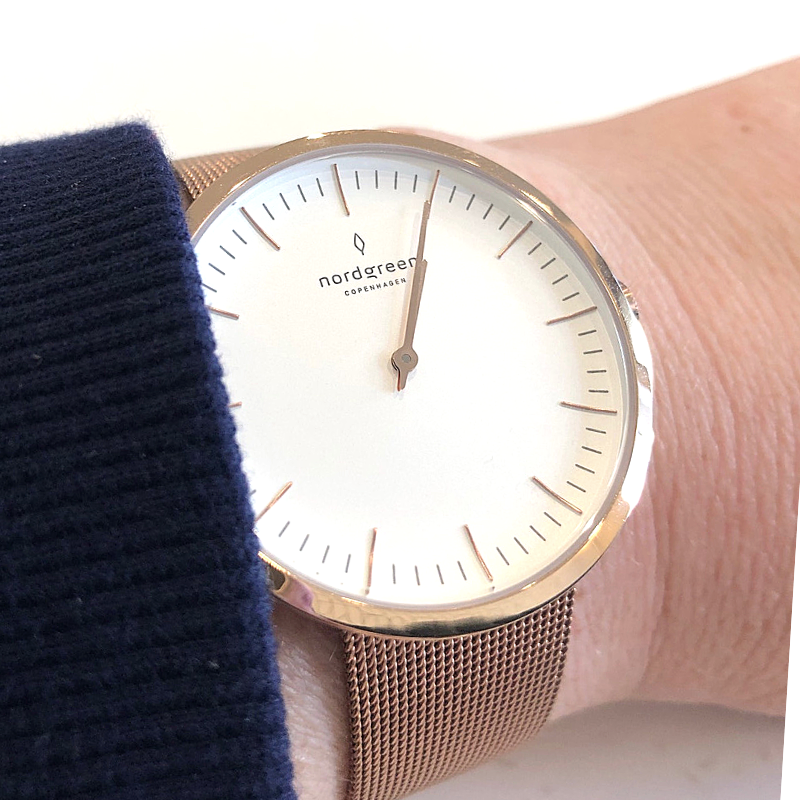 :) Well, we were both able to agree on these Scandinavian watches designed by the award-winning Jakob Wagner, a man with some serious design pedigree. Wagner has designed for Bang & Olufsen, B&B Italia, Alessi, and Cappellini, among others. In my opinion, someone with a design background melding minimalist Danish design with Italian luxury is exactly who I want designing my watch because I will have it for a long time. (No pun intended there!) Apparently, I’m not the only one who feels this way: Nordgreen raised over $275k with Kickstarter and IndieGogo campaigns to become the 10th-highest fundraising Kickstarter campaign in the fashion space from Europe. Nordgreen Copenhagen - 40mm Infinity in Rose Gold with Navy strap and Rose Gold hardware & 40mm Philosopher in Gunmetal w/ Navy Nylon strap with Gunmetal hardware. Nordgreen currently makes three styles: Philosopher, Native & Infinity. My husband loved the depth in the face of the Philosopher (plus, I think he enjoys thinking of himself as one) while I opted for a more minimal Infinity. The Philosopher shows the date and has a really cool seconds-hand, while the Infinity has removed these two features. The Native sits somewhere between the two, with the clean face of the Infinity but with a little less metal, akin to the Philosopher. I usually wear a 36mm watch and Mr. Capsule wears a 42mm (I think). We both decided to go for a 40mm watch for maximum versatility. OK, he’s unlikely to wear my rose gold mesh strap, but I’d totally wear his styles, if he’ll let me! I like the statement that a 40mm makes, but the style is sleek enough to not overwhelm my wrist. This is where things really get cool! You can change out the straps on any of the watches! Choose between genuine leather, vegan nylon, or metal mesh depending on the look you’d like to achieve. If you have a larger wrist, the nylon strap has the most length, with the mesh second and the leather third (at least on my wrist.) I have small bones but my wrist is a bit “abundant” but all of the straps work. All of the straps are adjustable and well-made. We opted for: Rose Gold mesh & Navy leather with Rose Gold hardware for me, and Navy Nylon with Gunmetal for the husband. Nordgreen surprised us with a Brown Leather & Gunmetal strap, too, and we love how different it looks from the navy nylon. Awesome versatility! I am looking forward to my navy leather breaking in a bit to soften around my wrist, yet it seemed to work just fine for my husband’s more angular wrist right out of the box. The mesh strap is easy to adjust. The nylon strap is quite long, so you may want to cut it and burn the end to stay secure, like those of you in my generation might have down with loafers with cord laces! Before you do that, though, try doubling the end of the strap back through the metal, which is what my husband did and it looks really cool. The Nordgreen.com website is robust with information and FAQs, from how to change straps to what all the movement specifics and water resistance stats are. I’ve also had a fabulous experience with their team, so I’m sure they can answer any additional questions you might have. As you can see in the pictures, I’ve tried to show you the rose gold against gold paint so you can see that it really us a beautiful rose gold. I have always loved gunmetal, and I think the navy works beautifully with both metals. Watches are an investment, like relationships with your loved ones. Nordgreen watches say “I love you” in a way that’s a special reminder that spending time with family and friends is the best gift of all. Second to that is a beautiful, minimalist timepiece that is an affordable watch for an investment piece in your wardrobe. Use discount code “CAPSULE20” to get 20% off your purchase! This is 5% more off than the current holiday discount on their website, so make sure you use this code!